I was recently re-watching DBZ dub episode 171 about how Gohan got his name, tree he crashed through as a kid etc. And a thought came to mind. Why didn't we ever see Grandpa Gohan in DBZ? I mean there were plenty of scenarios where goku could have found him in other world or the Z-fighters could have revived him with the Dragon Balls. And in addition to that IIRC, They wished for all the humans killed by the saiyan invasion to be revived, wouldn't that also account Grandpa Gohan since he was accidentally killed by Goku in his oozaru form? He expressed that he does not want to return to the world of the living ones. Goku fought against his grandfather (masked fighter) at a tournament hosted by Fortuneteller Baba. After revealing his identity to Goku, Upa (the boy whose father was killed by mercenary Tao and Goku went on a quest to gather the Dragon Balls and revive his father) asked him if he want to be revived instead of his father, but Gohan replied that there are a lot of "babes" in the after world and that he would like to stay there. 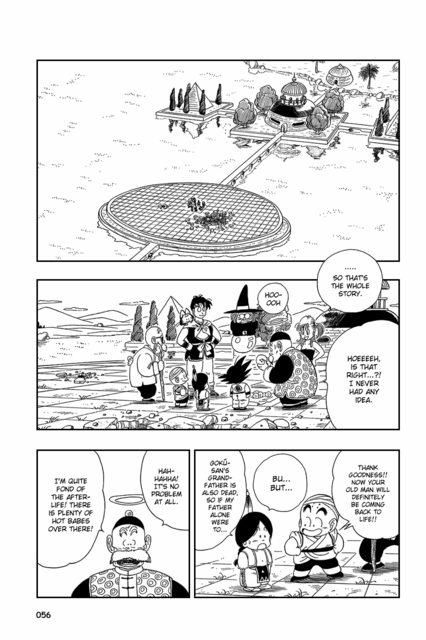 The chapter in question is 108 from the original Dragon Ball. The original Earth Dragon, created by Kami, could not resurrect anyone who had been dead more than one year. This was specifically brought up in the Namek Saga as a difference between Shenron and Porunga. When Dende made the second set of Earth Dragonballs, he specifically removed this limit. So until that point in DBZ, it would not have been possible to bring back Grandpa Gohan, since it had been more than a year since he died. Beyond that, as Proxy said, Grandpa Gohan didn't want to be revived, and a wish cannot bring back someone against their will. Do the other universes know that it was Universe 7 that wished them back using Super Dragon Balls?